Public Folder migration can be challenging in Exchange 2013 and 2016, when you’re migrating from older versions like Exchange 2003. Firstly, there is no public folder database in the latest versions, and secondly there is no direct native method to do so. If you still go by the native solution, then you’ve to first migrate the Exchange 2003 public folders to newer Exchange version (2007 or 2010) and then again to Exchange 2013/2016. Kernel for Exchange Migrator provides an effortless way to migrate your public folders from one Exchange version to another and without worrying about its large size. The Software smoothly migrates your public folders on all cross-forest Exchange environments (including Exchange 2003/ 2007/ 2010/ 2013/2016/2019). It helps you to avoid the complex public folder structure and focus on the migration better, without worrying about its sprawling size. Kernel Migrator for Exchange is designed to migrate your public folders from one Office 365 platform to another without a double hop migration. The solution also provides hassle-free PF migration from on-premises Exchange Server (any version) to Office 365 platform. You can immediately undo a wrong/mistaken migration task (in few clicks) without losing your head. It helps to keep up your migration pace as fast as possible, as if nothing went wrong. Specify what you want to carry in the public folders migration based on the defined date range, include/exclude criteria, message class(es). You can also apply filters on the migration jobs to migrate the data that matters to you. The solution lets you to execute the migration according to your convenience based on resource availability and other factors. The Scheduler allows you to create and execute a job automatically whenever you need. You can even define the blackout duration when you want to halt the migration, and it will resume afterwards. The Public Folder migration software helps you to maintain co-existence between the migrated and non-migrated mailboxes. 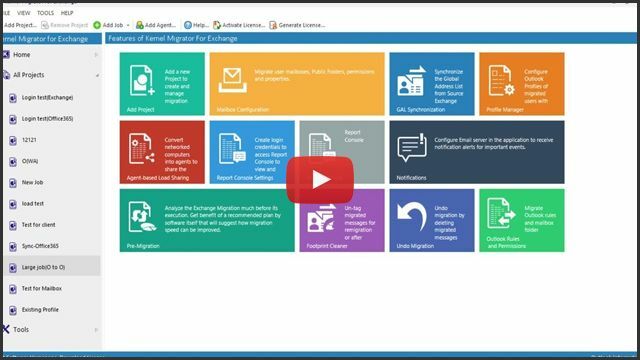 While carrying out the migration, the solution lets you to synchronize your mailboxes from source to target or target to source, which eventually eliminates the data integrity issues. What all scenarios are supported for public folder migration? When I migrate Exchange public folder to another domain server, then what happens to the existing Public Folder Rules and Permissions? Kernel Migrator for Exchange allows you to migrate complete data from Exchange public folder to another public folder in cross-domain environment. You can move your existing rules, permissions, Global Address List as it is from source to target location. Can I perform direct public folder migration from Exchange 2003 to 2013/2016? No. Exchange 2013/2016 does not support coexistence with Exchange 2003, also restricted by Microsoft. However, you can perform cross-forest Public Folder migration from Exchange 2003 to any newer version. With Kernel Migrator for Exchange, you can migrate Exchange 2003 public folder to Exchange 2007/2010. Similarly, you can also migrate Exchange 2007 public folders to Exchange 2010 only. Does your program delete anything from the source public folder? No. Kernel Migrator for Exchange does not delete or modify any information from the source server. It passively accesses your public folder data, without making any alterations to the contained data and its integrity. Can I migrate large-sized public folder database? Yes, you can. The solution allows easy migration of large-sized public folders from the supported source to the destination server. Does the program support on-premises Exchange Public Folder migration to Office 365? Yes, it does. You can migrate public folder from Exchange to Office 365 mailbox along with its limits, properties, and permissions.